Description: The ultimate age-defying foundation for infinite beauty. Works in perfect synergy with Future Solution LX skincare, to create an exquisitely radiant finish. Retextured, lifted, and brightened, your skin beams with flawless vibrance. 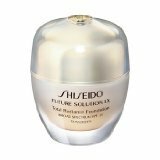 •Formulated with SHISEIDO's exclusive Skingenecell 1P, to counteract the appearance of future aging. •Contains 4MSK, an innovative brightening ingredient, for a luminous, more even skin tone. •Refines skin texture while enhancing your radiant complexion with Aura Radiance Powder. •The beautiful finish lasts throughout the day with Time Match Powder. •Corrects the visible signs of aging: loss of firmness, wrinkles, dark spots, dullness, and pores. •Maintains essential moisture for a long lasting healthy, brighter look.